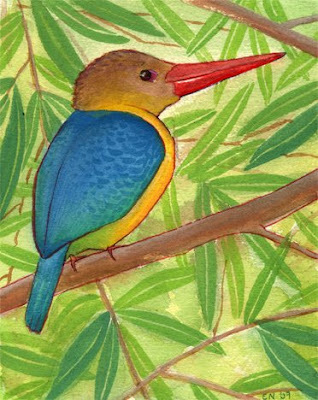 While doing some research for an upcoming project, I happened upon this little weirdo, the Stork-billed Kingfisher. I wanted to experiment with some cold press paper anyway, so I did a little painting. The process reminded me why I use (and love) hot press paper, but it was also fun to pull out the gouache to save this painting. This little guy was surprisingly difficult to draw, since he doesn't even look very believable in photographs. I fudged the color on his neck to that he looks a little more unified, but the proportions are all correct. Here's a link to more thoroughly weird photos, from a really excellent website, Surfbirds.com. But what is the upcoming project, you wonder? For now I'm keeping it secret, but I'm hoping it will be ready by the end of the month.